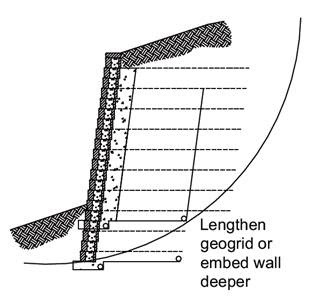 Increasing the length of the geogrid layers to force the minimum slip arcs deeper into the hillside. Increasing the depth of buried block to force the minimum slip arcs deeper into the hillside. Increasing the strength of the geosynthetic reinforcement layers to force the minimum slip arcs deeper into the hillside.